Victoria Azarenka is favored to win her first major down under. As week one at the Australian Open in Melbourne draws to a close, there are some mouth-watering matches we earnestly pray will happen. They involve top-ranked players as well as aspiring new-comers hoping to reach the summit by upsetting those at the top. We have already seen some heart-breakers like No. 6 seed Aussie Samantha Stosur stumbling out of the blocks as well as the top-ranked American Mardy Fish going out in the second round. But when a door closes, a window opens. These upsets might unveil a new talent preparing his or her first full-fledged assault on a major. As we head into round four, also called the round of 16, there are some challenging matches on tap—if only all the promised ones make it through the third round staging ground. Following are the matches we sincerely hope will happen. 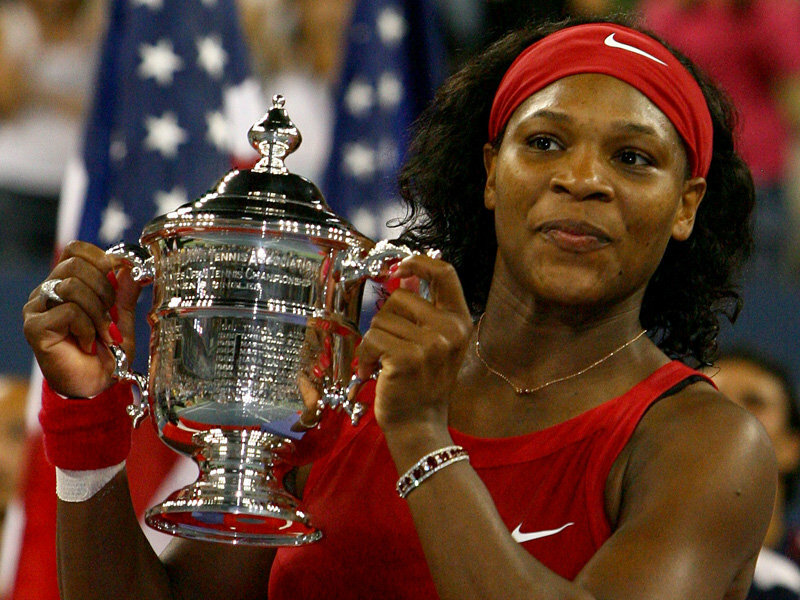 Serena Williams will look for a return to glory at the U.S. Open. Despite many writing off her chances of getting to the top of women’s tennis once again, Serena Williams has spoken about her positive preparations for the US Open next month. The younger Williams sister has fallen to number 175 in the world after an early exit from Wimbledon coming on the back of a year or so of constant injury problems. Her target is clear now though. She wants to get herself fit and ready for the US Open. She was perhaps running on adrenaline and determination at Wimbledon, at Flushing Meadows she wants to be in a better state to win the tournament. 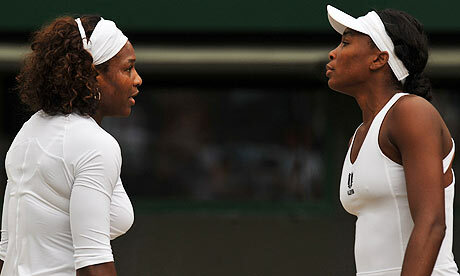 Will Serena and Venus Williams be able to recover from injuries and recent losses to regain their tennis dominance? With women’s tennis seemingly in a state of flux it would seem foolish to write off Venus and Serena Williams after they crashed out of Wimbledon at the fourth round stage. Serena’s title defense came to a halt when Marion Bartoli of France claimed a straight sets win 6-3 7-6 (8-6), while Tsvetana Pironkova scored an even more comprehensive victory over Venus taking the match 6-2 6-3. There were always doubts about Serena’s ability to cut it at Wimbledon this year as she was recovering from the various problems which had kept her out of the game for over a year, but there still has to be worries about her ability to compete at the highest level. Those planning to bet on US Open action will have to think long and hard before backing her. 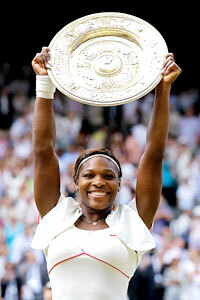 It may be difficult for Serena Williams to repeat her Wimbledon title in 2011. Serena Williams’ place in the order of Open era Wimbledon greats is hard to measure. Although Roger Federer is certainly near the top of the list of male Wimbledon legends, Serena, the female incarnation of the modern great, might not even be the best Wimbledon player in her family. It is too early to write the 13-time slam winner’s career obituary, although her prospective absence from this year’s tournament would make her a less dominant favorite in 2012 at the age of 30 with a serious medical problem only just behind her. Anyone looking at the 2011 Wimbledon betting will doubt her ability to challenge this year. Although the Williams sisters have prospered as siblings on the WTA tour, their bond allowing greater longevity than most of their rivals have achieved, they suffer from their family connection when it comes to an evaluation of achievements, especially at Wimbledon. The tournament at Indian Wells gets underway on Monday March 7. The BNP Paribas Open at Indian Wells gets underway starting March 7. It is easy to see that the 36-year old tournament has grown into a major attraction for tennis fans in this country as the stands and grounds become packed with spectators each year when March rolls around. Some tennis aficionados have grown so enamored with the annual event they now call it California’s version of a fifth major. This year’s Masters Series 1000 Tournament, whose inaugural event took place in 1976, is now held annually at the Indian Wells Tennis Gardens after several location changes during its history. It features both a men’s and a women’s draw with the top players attending, hoping to add this prestigious title to their respective resumes. For the ladies field, the tournament gradually evolved into a top tier event. In the beginning it was non-sanctioned. It became, however, an official WTA Tour event in 1991. Initially the women’s tournament preceded the men’s but in 1996 tournament sponsors along with the WTA and ATP decided to hold both competitions concurrently. Unlike the men, the women have no player who has won this tournament three times. In the women’s competition, however, seven players have won the tournament twice—Daniela Hantuchova 2002 and 2007, Kim Clijsters 2003 and 2005, Serena Williams 1999 and 2001, Lindsay Davenport 1997 and 2000, Steffi Graf 1994 and 1996, Mary Jo Fernandez 1993 and 1995 and Martina Navratilova 1990-1991.
Who will add to these totals in 2011? 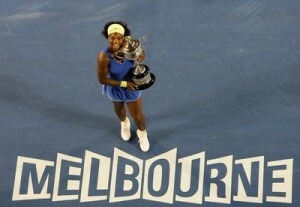 Serena Williams was the last Australian Open champ in 2010. Most of the ladies crowned as champions of the Australian Open hailed primarily from Australia back in the early days of this prestigious tennis tournament. Distance from European capitals and the United States kept the Australian Open a happening mainly for locals, although there were foreign winners from time to time. Overall Australians have won 43 Australian Open titles, 33 during the Amateur Era and 10 during the Open Era. 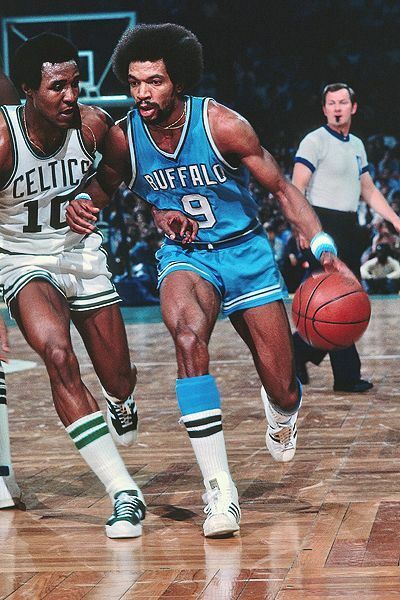 Their first championship came in 1922 and their last in 1978. 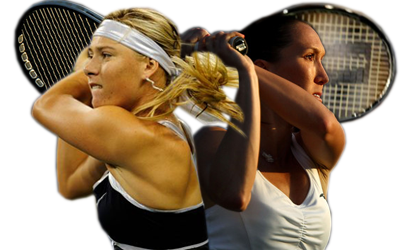 The Aussies are all hoping Samantha Stosur can add to their total by winning the championship in 2011. The time is now for a native to win the trophy––it has been 33 years, after all. With defending champion Serena Williams not playing in 2011 because of injury, this year is wide open for the ladies as they look to crown a new champion. Female champions from the United States are second having won 22 Australian Open titles, 7 in the Amateur Era and 15 during the Open Era. Half of the ladies in this Top Ten list are logically from Australia and many of them represent titles won during the Amateur Era which began back in 1922. But all have outstanding results in the “Happy” Slam now held annually in Melbourne. 10. Australian Joan Hartigan Bathurst: Won in 1933, 1934, 1936 – 3 Finals, 3 Wins, 2 Consecutively. Joan Hartigan Bathurst won three Australian Open titles in her career. Australian Joan Hartigan-Bathurst played her first Australian Open Championship in 1931 and her last one in 1947. She won three championships during her long career. 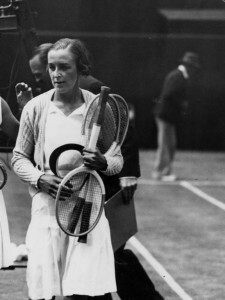 Traveling outside of Australia, Hartigan-Bathurst also made the semifinals at Wimbledon twice. She never, however, traveled to play in the United States championships. During her years playing on tennis courts around the world, Hartigan-Bathurst won three Australian Open titles, made the semifinals twice and the quarterfinals four times. In 1933 Hartigan-Bathurst defeated Coral Buttsworth to win her first Australian Open title 6-4, 6-3. The Aussie repeated as champion the following year defeating Margaret Molesworth 6-1, 6-4 in 1934. Her next Australian Open Championship came in 1936 when Hartigan-Bathurst won over fellow Aussie Nancy Wynn Bolton 6-4, 6-4. 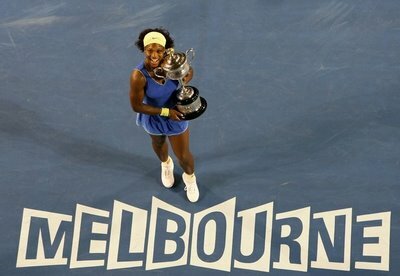 Overall she played in 10 Australian Open Championships, winning three times. Her win loss record was 48-7 giving Hartigan Bathurst a winning percentage of 87.27.